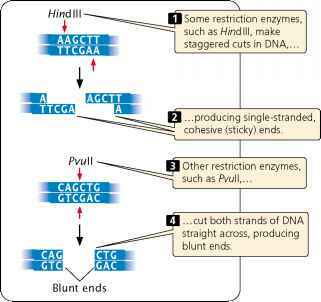 Note: The first three letters of the abbreviation for each restriction enzyme refer to the bacterial species from which the enzyme was isolated (e.g., Eco refers to E. coli). A fourth letter may refer to the strain of bacteria from which the enzyme was isolated (the "R" in EcoRI indicates that this enzyme was isolated from the RY13 strain of E. coli). Roman numerals that follow the letters allow different enzymes from the same species to be identified. For convenience, molecular geneticists have come up with idiosyncratic pronunciations of the names: EcoRI is pronounced "echo-R-one," Hindlll is "hin-D-three," and Haelll is "hay-three." These common pronunciations obey no formal rules and simply have to be learned.